Comet 206458A Button Inserts for Comet 40/44D, CAT99 and TC88 Driven Clutches. Sold as 3 per Package. Comet 206458A. Package of 3 "Push in" Button Inserts for Comet 40/44D, CAT99 and TC88 Driven Clutches. 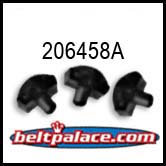 3 Pack insert buttons for Comet TC88 and CAT99 centrifugal clutches. Comet 40/44 Series insert buttons. Comet industries part 206458. Comet CAT99 "Red" Spring. Comet part 204114A. COMET 200398 (A-DF), Comet Industries belt 993-95 for CAT99 Series, OEM 993-95 Go Kart belt. Comet 200398 (A-DF) Go Kart Belt is exact replacement for Comet Industries belt 993-95. Replaces OEM Comet CAT99 Series. Torq-a-verter belt. Measurements: 5/8� Inch Top Width (.625 inch) x 32-13/64� (32.20) Inch Length. Asymmetric Cogged belt. A popular size ATV belt, Go Cart belt, Golf Cart drive belt, People Mover clutch belt, and Mini-Bike drive belt. Comet 209133A. Comet Industries 40D (7.5� Dia.) Driven Clutch #209133. 3/4" Bore. Comet 209133A. Comet Industries 40D (7.5� Dia.) Driven Clutch #209133. Specifications: Symmetric Belt System, 3/4� Bore, 7-1/2" Diameter, 3/16" keyway.